When thousands of health care professionals at the Veterans Health Administration (VHA) greet their patients every day at more than 1200 facilities around the country, the first thing they say is: “thank you for your service.” Their own dedicated service to 9 million veterans is equally worthy of gratitude–and most of those benefiting from it freely express theirs as well. Unfortunately, President-elect Trump, who never served in the military, doesn’t feel the same way about the care provided by the VHA’s 300,000 employees or show similar respect to their patients. In his recent campaign, Trump said mentally ill veterans for weren’t strong and “can’t handle it”(not to mention calling former Navy pilot John McCain a “loser” for being shot down in combat, badly injured, captured and then abused as a prisoner of war). Trump also favors privatization of VHA services across-the-board. Congressional Republicans will now have an Oval office champion for their efforts not only to repeal “Obamacare,” but to begin the process of dismantling the VHA. Trump’s VA transition team includes Darin Selnick, Executive Director of CVA’s Fixing Veterans Health Care Taskforce and a Senior Veterans Affairs Advisor for Concerned Veterans for America. Compared to mainstream veterans organizations like Disabled American Veterans, Veterans of Foreign Wars, or Vietnam Veterans of America, the CVA it has no significant veteran membership but is instead financed by the conservative Koch Brothers to promote their broader anti-government agenda. This weekend, for example, Selnick spoke at the American Association of Medical Colleges in Seattle, where he promoted the CVA privatization agenda. Far from rationing care, the VHA shields its patients from the kind of overtreatment that is rampant in for-profit health care chains. There, doctors and hospitals work under a fee-for-service model and have financial incentives to over-diagnose their patients, sometimes providing unnecessary medications and procedures that may worsen, rather than improve, their health. Patients and their families end up buried in bureaucratic paperwork—including regular billing for hefty co-payments, deductibles, and premium payments (steadily rising for many purchasers of insurance in ACA-created state exchanges). Pipes, Selnick, and other anti-government ideologues are promoting themselves as experts on the VA and veterans health problems. Veterans service organizations must therefore fight for the VHA and for the real experts who care for them day in and day out at VHA’s all over California and the nation. They must challenge the VHA bashing that is proving to be increasingly demoralizing for these VHA clinicians and other health care workers who have devoted their lives to the mission of serving veterans. In the course of writing a book on VA healthcare, I have observed these caregivers at work in more than 25 hospitals and clinics across the country. I have sat in on meetings with patients, therapy sessions, home visits, and seen VHA staff in action in rehabilitation and mental health facilities and providing care in many other settings. Nurses, physicians, social workers, psychologists, clerks, and many other VHA staff – including administrators — embody a commitment to serving patients often missing in other health care systems, because of the way the latter are structured and run. One third of all VHA employees are veterans themselves. Even VHA staff members from civilian backgrounds see their professional practice as a calling, not just a career. As one doctor told me,” I didn’t go to work at the VA to devote my life to veterans but the minute I saw my first veteran patient, I knew this was my life’s work.” Whether veterans or non-veterans, many VHA staff could earn more in private sector jobs, yet they choose to remain at the side of those who also served in uniform. Lately, one unanticipated and demoralizing reward for this life of service has been media coverage, endlessly negative, factually inaccurate, and unfair. Intentionally or not, that VHA bashing in the press had helped lay the ground work for what will now be a four-year effort to dismantle the VHA and to channel veterans into private sector facilities much less well equipped to meet their needs. Trump’s own ignorant and insensitive comments, on the campaign trail, have already undermined VHA efforts to destigmatize mental illness through campaigns like Make the Connection and get more vets to sign up for treatment that is far superior to any available at places like Kaiser, a frequent source of complaints about inadequate mental health care in California. Before Trump’s election, morale at the VHA was already poor. Now, many VHA employees are truly in despair about the future of a healthcare system providing, what author Phillip Longman calls “the best care anywhere” in a book by that title. 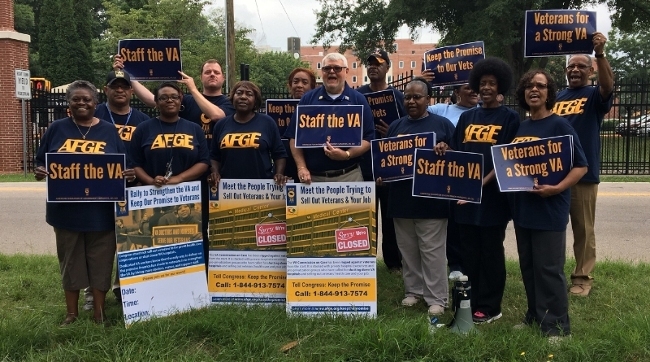 Veterans and veterans’ service organizations need to defend the VHA and its veteran and non-veteran employees who have stuck with them, through thick and thin and who have amassed expertise on veteran health issues unavailable in the private sector. The ranks of the VHA are filled with people who are no “summer soldiers” or “sunshine patriots” in the field of healthcare delivery. They have remained at their posts, despite political attacks, media derision, under-staffing, and dealing with patients whose wounds, both mental and physical, are often difficult to heal. If their jobs, working conditions, and careers are undermined by the Trump Administrations, veterans will indeed be the biggest losers. Healthcare journalist Suzanne Gordon is writing a book about VA healthcare.